A young boy is found dead on the beach of a small British coastal town. Detectives Hardy and Miller (David Tennant and Olivia Colman above) are on the case. 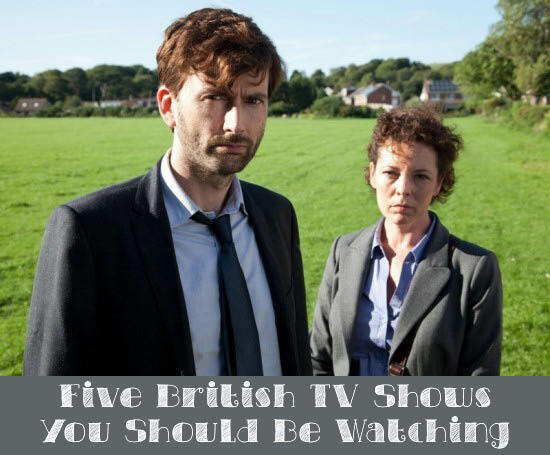 Broadchurch is just as much a story about grief and community as it is a murder mystery. The acting is brilliant, so much so that at times I forgot I was watching actors and let me tell you, that does not happen often. The cinematography is beautiful and looks more like a film than a television show. Be warned this is an incredibly heartbreaking story. When I finished watching the last episode I need a big ol' bear hug. Broadchurch is on BBC America. You can find the first season on Amazon and iTunes. Frankie is a visiting nurse who is incredibly good at her job. You get to meet her, her mean boss, her coworkers, and her police officer boyfriend. She is a spunky, smart, independent lady who rocks out to her favorite tunes, eats cold pizza for breakfast, and always puts her patients first. Frankie is the love child of a contemporary less sentimental version of Call the Midwife and Nurse Jackie minus the pills. Franie is on BBC America. You can also find full episodes are available on You Tube. Speaking of Call the Midwife, the star of this show is Miranda Hart, one Chummy from CTM. Hart was a stand up comic before her acting career. Who knew? Miranda is a funny, silly, feel good hal hour show about a single woman in her thirties, her small group of pals and the shenanigans they get into. Every episode ends with the cast singing a song and waving good night to the audience. I mean come on! I dare you not to smile while watching that! Watch Miranda when you need a pick-me-up. Series one and two are available on DVD. This one hour drama just began airing on PBS Sunday nights. After their grandsons put them on Facebook, two senior citizens and ex schoolmates, Alan and Celia, find each other after 60 years and their love reblooms. Their story is a sweet one that is complicated by their respective families. Derek Jacobi as Alan is incredibly charming and Celia's daughter steals the show as a very clever, strong, and verbal headmistress who does not take any flack, Jack. This show gracefully illustrates that life is messy and family is everything. Be prepared with a cup of tea because it flows heavily on this show. Always with the kettles and tea making! Series one is also available on DVD. An older series than Last Tango in Halifax but with a much younger couple that also get together after connecting online. Gavin and Stacey are in their early twenties when they meet, fall in love, and carry on a long distance relationship (he's in England she's in Wales). We get to meet them when they meet each other in person for the first time. Gavin and Stacey are a couple of sweethearts that you will quickly love to watch. Their more outlandish friends and family make this half hour comedy a great one. A US remake is scheduled for this fall on Fox entitled Us & Them. Do yourself a favor and watch the original instead of, or at least before, the US version. I am a Gilmore Girls fan too but Alexis Bledel does not have half the charm as the original Stacey played by Joanna Page. Available on DVD and on iTunes.